"It's Like I Have ESPN or Something"
Stereotypes are what have made our world stay pretty normal. But who even knows what 'normal' means? In a regular dictionary, normal is defined as 'serving to establish a standard'. Excuse me, but what? Conforming has never been in my vocabulary. 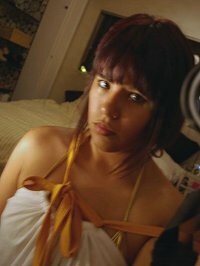 Yes, my high school years involved strict uniforms, but I made them my own. The stereotype I despise the most is that an intense interest in sports is confined to the male race. Anyone can see that we have fantastic female athletes. However, this article is not about that; it is about female sports spectators. All my life watching sports has been a normal thing. My dad can remember when I was super young and so excited to go to basketball games. From the end of October to the end of the NBA playoffs my world was and is basketball. I can name star players, stats, and team benches. But the thing that frustrates me is how most girls only know certain aspects of sports. A key example would be Lebron James' move to the Miami Heat. Being a Heat fanatic, I looked at stats to see how he would impact the team, while other girls just wanted to gossip about how attractive he is. I can keep up in an in-depth conversation with guys about sports, whether it be last night's game or the upcoming draft. Does it surprise them? Always. Once they get their chins off the ground we end up having a fantastic conversation. I don't like to brag about my knowledge, but when I hear a conversation about the NBA and I don't agree, I have to speak up and let my opinion be known. There aren't many women in the sportscasting field. Some of them do know their stuff, but others seem just to be a pretty face. I want to change that. Women have overcome so much more, so this is cake. My dream? To work for ESPN and interview athletes and show how much I know. Not all girls will be like me - sports is my life. I want girls to understand that being an athlete or having a guy in their life are not the only reasons for getting into sports. You can call me a feminist, or any other word for standing up for women - it doesn't bother me. Sports aren't gender segregated at all, though a lot of guys find it attractive if you can talk sports. Just be true to yourself; if you know you love something, don't think twice about what others might think. Let them judge, but they are just missing out. Stereotypes were made to keep people in groups, which isn't cool at all. Be different. Believe me, it's fun! Subject: "It's Like I Have ESPN or Something"